E3 2007 Predictions | 2P START! 1.) The summer “videogame drought” is more bearable with all the gaming news we get at E3. 2.) There’s less time to wait between E3 and all the holiday releases we’re anticipating. Alright, so there’s at least two reasons why E3 2007 will be better than previous years. Let’s hope we get some substantial announcements from the big three. Hahaha. Love the Killzone 2 quote and I love the Red ring of death. Liking the new layout! now how would sonic be if nintendo created him? probobly use punches more than kicks, super smash would be exactly like marios but its blue and the flames are sonic going fast, assist trophie ether tails or knuckles or even shadow and i just can’t amagin him with different costume omg red sonic! Abandon all hope, ye who attend the confrence, once you see THE RING. WIN. It’s Final Smash though. YOU’RE TOO SLOW! CMON, STEP IT UP! That is great! 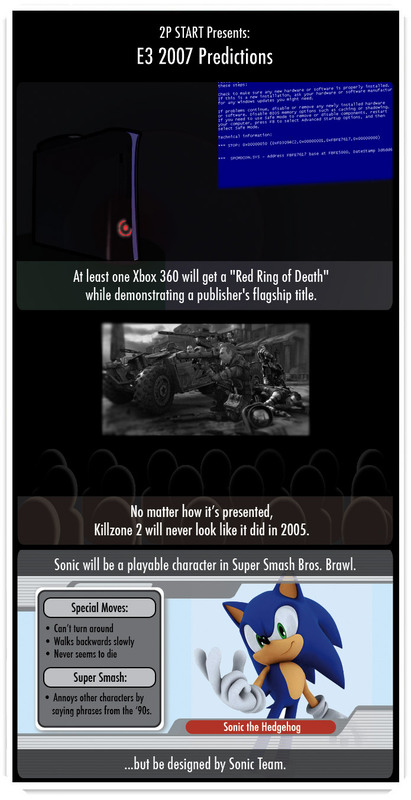 Predict some for E3 2010!